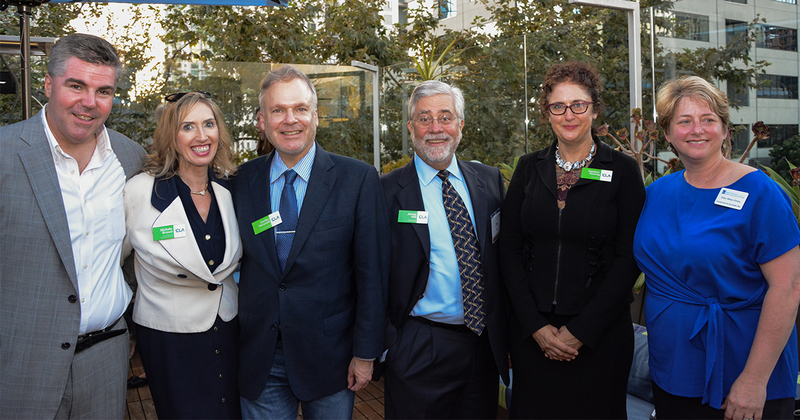 Klinedinst co-hosted a reception for the California Lawyers Association (CLA), the nation’s second-largest professional association for attorneys. Held on August 16, 2018 at the Hotel Republic, the event brought together leaders from San Diego’s legal community, including Klinedinst’s own Heather Rosing (second from right).. Pictured (l-r) are Chip Wilkins, Michele Brown, Emilio Veranini, Jim Hill, Rosing, and Ellen Miller-Sharp. SAN DIEGO, CALIFORNIA – Klinedinst was proud to co-host the California Lawyer Association’s San Diego Summer Reception, held on August 16, 2018 at Hotel Republic. The California Lawyer Association (CLA) reception was the first of its kind in the state, bringing together hundreds of leaders from San Diego’s legal community to meet face-to-face with CLA executives and learn more about the organization’s direction in the years ahead. CLA is the new home of the Sections of the State Bar of California, as well as the California Young Lawyers Association. The organization was formed when Governor Jerry Brown signed SB 36 into law, separating most of the professional association activities of the State Bar of California into a separate non-profit entity. CLA launched on January 1, 2018, with a mission to promote the professional advancement of all attorneys practicing in California. With the long-standing State Bar Section members automatically becoming part of the organization, CLA instantly became the nation’s second-largest voluntary bar association in the country. Klinedinst’s Heather L. Rosing was elected to serve as the very first President of the California Lawyers Association. “We were thrilled to see so many leaders of the legal community come out for this special event,” said Rosing, who was joined by Jim Hill, Chair of the CLA’s Board of Directors and other CLA leaders and board members to welcome attendees and answers questions. Nearly 300 registrants came together on the rooftop deck of Hotel Republic to take in the warm summer weather. Leaders from San Diego area bar organizations, as well as local attorneys joined CLA executives to hear about upcoming events, to register for a section, and to find out how their practice could be helped by getting involved in CLA.